Allen J. Bard in 2014. Allen Joseph Bard (born December 18, 1933) is an American chemist. He is the Hackerman-Welch Regents Chair Professor and director of the Center for Electrochemistry at the University of Texas at Austin. Bard is considered a “father of modern electrochemistry" for his innovative work developing the scanning electrochemical microscope, his co-discovery of electrochemiluminescence, his key contributions to photoelectrochemistry of semiconductor electrodes, and co-authoring a seminal textbook. Allen J. Bard was born in New York City on December 18, 1933. He attended the Bronx High School of Science and graduated from the City College of New York in 1955. He then attended Harvard University, where he earned a Masters (1956) and a PhD (1958). In 1958 Bard began working at the University of Texas at Austin and has continued there for his entire career. However, he took a sabbatical in 1973 and worked in the lab of Jean-Michel Savéant. He also spent a semester at the California Institute of Technology as a Sherman Mills Fairchild Scholar. He lectured at Cornell University for the spring term in 1987 as a Baker Lecturer. In 1988 he served as the Robert Burns Woodward visiting professor at Harvard University. Bard has published more than 900 peer-reviewed research papers, 75 publications, and has more than 23 patents. He has written three books: Chemical Equilibrium; Electrochemical Methods - Fundamentals and Applications, and Integrated Chemical Systems: A Chemical Approach to Nanotechnology. The title, "Electrochemical Methods - Fundamentals and Applications," is the defining text on electrochemistry in English, and generally referred to as just "Bard." Bard is married to Fran Bard, with two children, Ed and Sara, and four grandchildren, Alex, Marlee, Rachel, and Dylan. 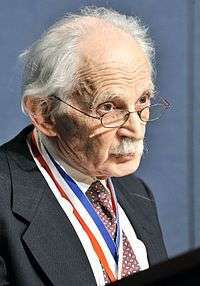 Among Bard's awards are the Priestley Medal in 2002 and the 2008 Wolf Prize in Chemistry. He was elected a Fellow of the American Academy of Arts and Sciences in 1990. Bard was elected to National Academy of Sciences in 1982. On January 13, 2014, Dr. Allen Bard was awarded the Enrico Fermi Award along with Dr. Andrew Sessler. The Electrochemical Society established the Allen J. Bard Award in 2013 to recognize distinguished contributions to electrochemical science. ↑ "For Creating New Field of Science, Texas Chemist Wins International Prize", January 23, 2008, retrieved July 7, 2008. ↑ "President Obama Names Scientists Bard and Sessler as Enrico Fermi Award Recipients" DOE Press Release: Jan 13, 2014. ↑ "Society Awards". The Electrochemical Society. "Goodenough, Bard Win National Medals of Science"